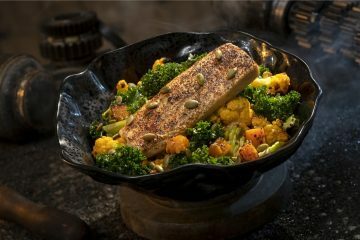 We’re only a handful of months away from the opening of Star Wars Galaxy’s Edge at Disneyland Resort, and we are beginning to learn more specific details of what park guests can expect when visiting Batuu this Summer. Hit the jump to get a round-up of all of the new information and to see some new photos and concept art of what’s in store when you visit a galaxy far far away. 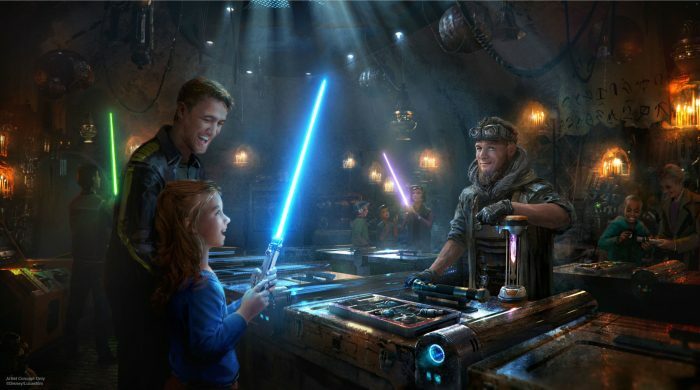 Savi’s Workshop will allow guests to build their own custom lightsaber in a effects experience similar to Ollivanders at the Wizarding World of Harry Potter. Guests will put together a lightsaber that is unique to their personalities. 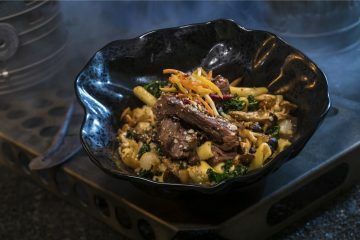 Guests will choose from kits: Peace and Justice (Republic-era Jedi designs), Power and Control (Dark Side designs), Elements and Nature (saber designs that use raw and natural materials) and Protection and Defense (ancient almost medieval in style). The colors of the lightsabers depend on the kyber crystal you purchase to power your saber. Colors include red, blue, green, and purple. 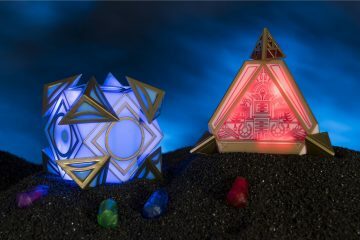 The Kyber Crystals can be removed and added to a Holocron cube to access lessons from/about iconic characters. These sabers are better looking than traditional Hasbro toys. The finished hilt will cost about $110, and the blade itself requires an additional $50. Strangely, it doesn’t seem like these lightsabers will be interactive in the land of Batuu in the same way that the wands are interactive in the Wizarding World. Maybe it’s smart that they didn’t create interactive spots to have kids swing lightsabers around. 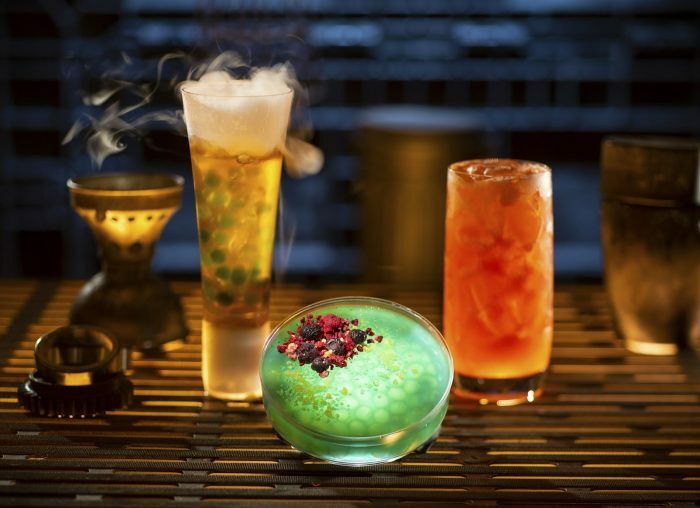 Mubo’s Droid Depot will allow you to purchase your own small scale interactive droid that will interact with the land and characters in Galaxy’s Edge. Two different basic models will be offered, an R-series (that looks like R2-D2) and BB-series (in the style of BB-8), but they can be customized in look. You choose the parts, assemble them, choose a personality circuit and activate the droid. 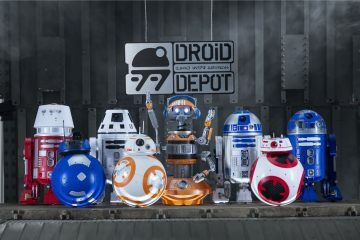 The store will also offer pre-built droids for those who don’t want a custom experience, as well as droid-inspired products and more. I would love to create my own droid as a kid. 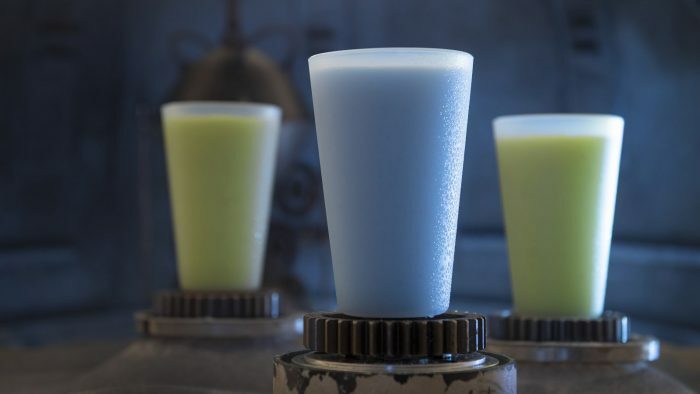 Heck, I’ll probably end up buying a bunch of these when Galaxy’s Edge opens. I’m a little skeptical of if a kid really wants to carry around a clunky to hold droid so that it can interact with Stormtroopers and droids around the land. I feel like for the most part; they are going to be in a box or bag until the kids get home to play with the droid, so I’m not sure I understand the interactive element of this toy in Batuu. Qui’ra mentions this Ithorian art and archaeology dealer in Solo: A Star Wars Story, and he is the gatekeeper of the black market in Batuu. His shop is filled with collectibles from all over the galaxy, some of which are not for sale and fun easter eggs and references to the films and books. 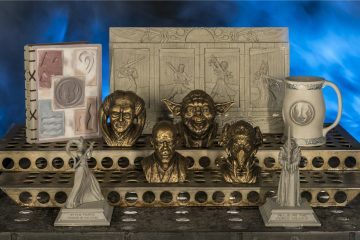 Here is where you can buy more collectible-style merchandise, like Jedi statues, Holocron cubes, and “historic” lightsabers (i.e., ones used by characters from the movies). 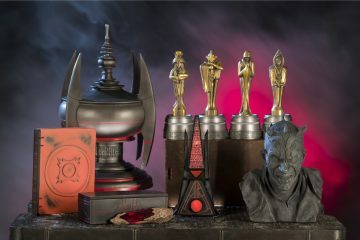 I might be sounding cynical here: I love the idea that everything in this land is in-universe, BUT I’m not sure these in-universe collectibles like the Oscar-looking statues are going to sell. I feel like eventually, they are going to be selling Sideshow and Gentle Giant style collectibles in this store, just with different in-universe packaging. I’m excited to explore the store and try to spot all the easter eggs. 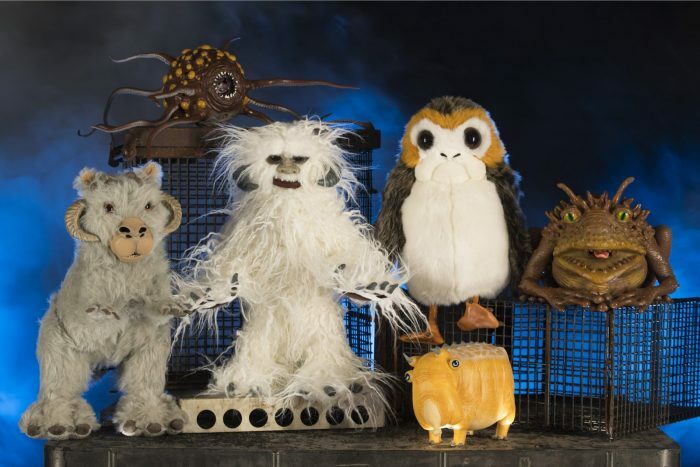 Bina’s Creature Stall is where you can purchase creatures from this galaxy, including toy versions of Porgs, baby Tauntaun squawks, miniature rathtars, worrt frogs and pufferpig. 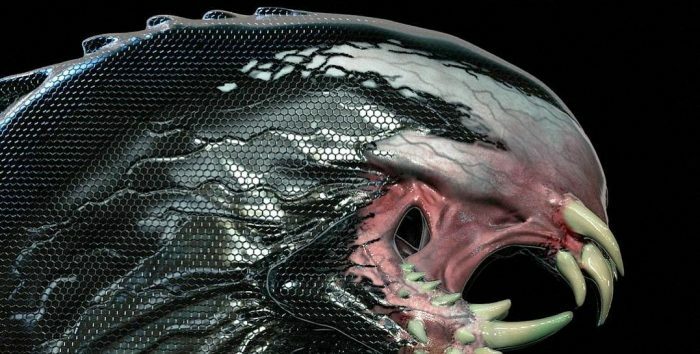 Animatronic creatures from the films will be featured in the cages surrounding the shop. Toydarian Toyshop: Buy handmade toys from this galaxy like the stormtrooper young Jyn Erso played with at the beginning of Rogue One. 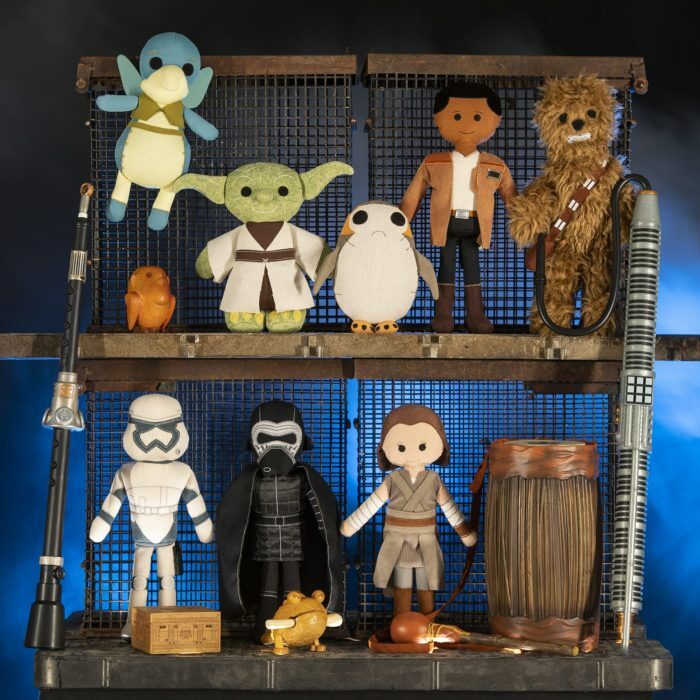 There are handmade doll versions of all our favorite characters as their legends have gotten across the galaxy. 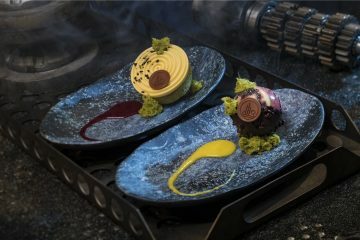 None of the merchandise in Batuu says “Disneyland” or “Star Wars” on it. These are particularly cute, and I hope they sell and don’t abandon this concept. 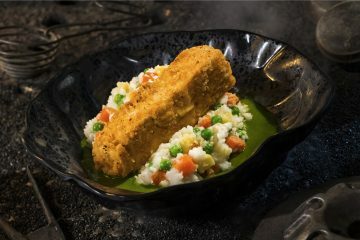 Roleplaying in Batuu will work through the Play Disney Parks app, which uses Bluetooth technology and GPS location services. Most of it will work offline, so if the cellular towers or Wifi aren’t enough to handle the crowds, it will mostly still work. Park guests will choose to align themselves with The Resistance, the First Order or a group of scum and scoundrels. The game connects with doorway control panels being used as a First Order surveillance system throughout the outpost. You can go on a mission to scout a Resistance invasion or collect information for the First Order. Hack: access the memory banks of droids and interact with devices. Scan: reads shipping labels to reveal what’s inside cargo containers. Translate: decipher languages spoken by alien creatures and on signage. Tune: decode secret radio transmissions. The app also provides a job board that pairs park guests with missions that will send them around the land. Galactic credits will be awarded for successful missions, but it’s unclear what these credits can be used for. The app will allow you to engage with full-scale droids who you see around Batuu. I have been very curious how Disney Imagineering was going to make the role-playing experience work. Doing it all inside the App feels very functional, but at the same time I was hoping it would be more interactive in that you would be going up to animatronic creatures and interacting with them, and the interactions being unique to you and your experiences/reputation. 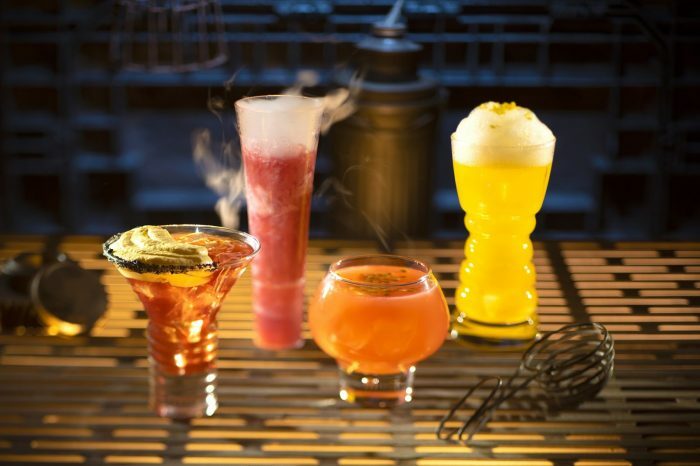 Drinks include The Outer Rim, Fuzzy Tauntaun, T-16 Skyhopper, Dagobah Slug Slinger, Jedi Mind Trick, Yub Nub, Jet Juice, Bloody Rancor, Spriran Caf, and Bespin Fizz. 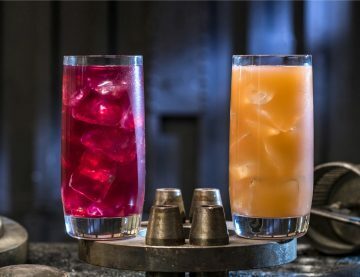 They will also have non-alcoholic drinks for the kids, including Black Spire Brew, Tarine Tea, Blue Bantha, Cliff Dweller, Hyperdrive, Punch It, Jabba Juice, Moogan Tea, and Carbon Freeze. 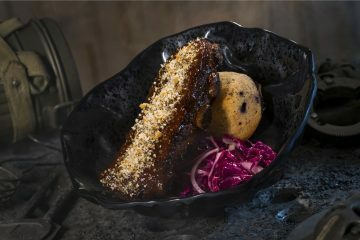 Menu items include the following: Braised Shaak Roast, Ithorian Garden Loaf, Smoked Kaadu Ribs, Fried Endorian Tip-Yip, Yobshrimp Noodle Salad, Felucian Garden Spread, Oven Roasted Burra Fish, Oven Roasted Tip-Yip. Drinks include Moof Juice and Phattro. 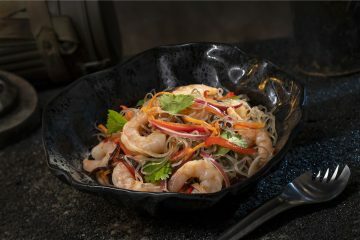 The children’s menu includes Fried Chicken with Macaroni & Cheese, Chilled Shrimp with Vegetables and Rice, Noodle Salad, Sweet Orange Dressing. And some desserts are offered. 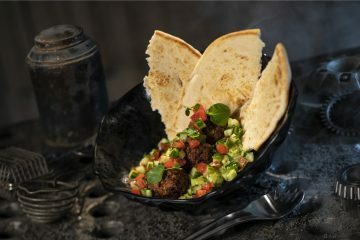 I like that all the food looks otherworldly and so interested to try it all. The Milk Stand is where you can buy Blue or Green (Ach-to style) Milk, a non-dairy beverage. They are offered in chilled or slushie versions. I’m not a huge fan of milk but am hoping these will taste as good as the Butterbeer at Universal. 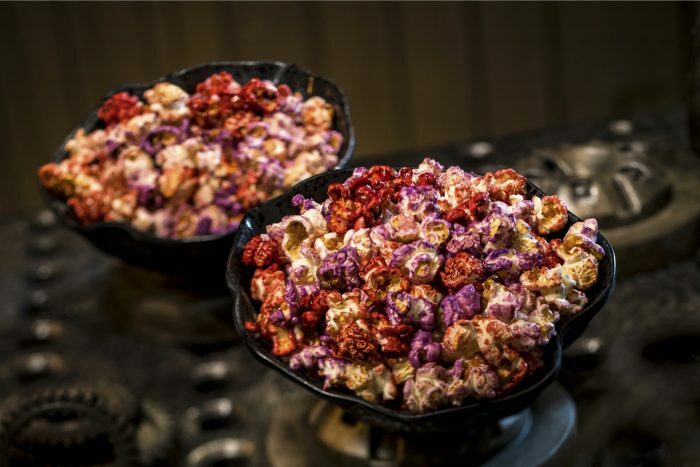 Kat Saka’s Kettle is a stand that will offer Outpost Mix, which is a combination of sweet, savory and spicy popcorn flavors. 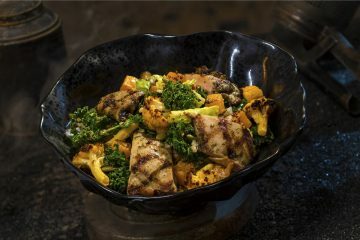 Ronto Roasters is where an eatery where the food is cooked on ovens retrofitted from podcasting engines. 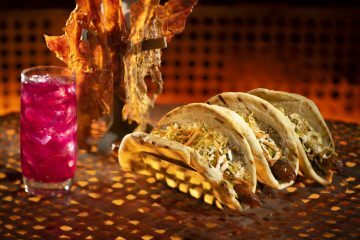 Bakkar and his former smelter droid 8D-J8 provide some alternative food and beverage options, including the Ronto Wrap, Turkey Jerky, Tatooine Sunset, Sour Sarlacc, and Meiloorun Juice. Every cast member in Galaxy’s Edge chooses their own outfits from a set variety of options depending on where they “live” in Batuu, and they will all develop their own characters with their own opinions and allegiances in this world. 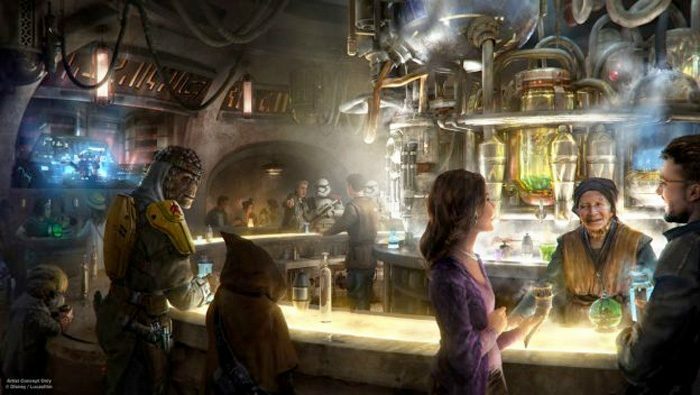 Rey, Finn and Poe Dameron will be characters in this attraction. Rey and BB-8 will be featured in a pre-show Comms room as a holo transmission, recruiting your group to join the Resistance to go on this secret mission. The Resistance’s newly established base on Batu is located in an ancient cavern just outside Black Spire Outpost. The queue goes through the laser-carved tunnels of the base before combining with the FastPass line. Nien Nunb appears in the initial shuttle flight. Poe Dameron escorts the shuttle his X-wing. 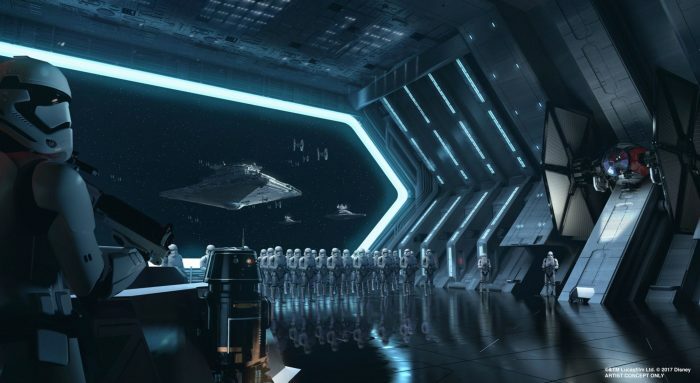 The Star Destroyer’s hangar will include 50 stormtroopers, some of them moving and some of them not. In the brig, your group of 50 or so people will be interogated by Kylo Ren. I’ve personally heard that the dark ride itself is in the 5 to 6-minute range, but pre-show elements include themed experiences (not just queues) and experiences like the stretching room in the Haunted Mansion which are definitely part of the attraction experience. I’ve also heard in the encounter with Kylo Ren on the star destroyer, you will actually feel the heat from his crossblade lightsaber. 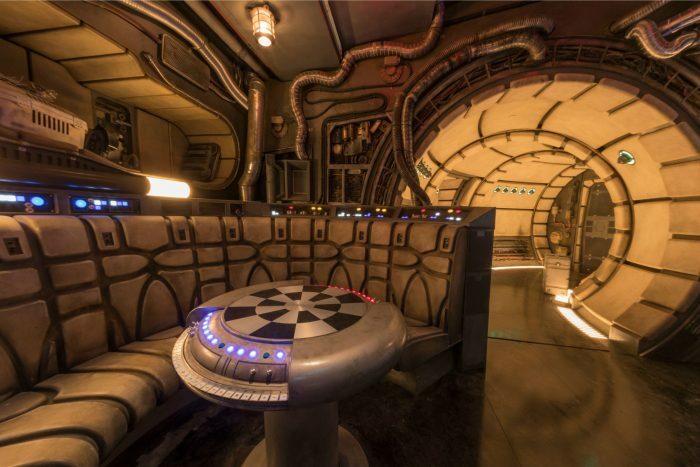 Millennium Falcon: Smuggler’s Run is a motion simulator-type attraction, but unlike Star Tours, the guests aboard the cockpit of the fastest hunk of junk in the galaxy will be in control of their trip. As for new details, it was confirmed that the ride will not be in 3D or require 3D glasses. 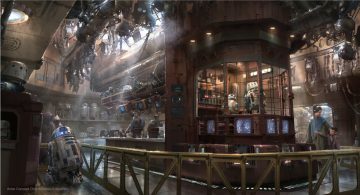 Guests will receive a boarding card before you step into the queue, which takes you indoors through Hondo’s hangar and a second-floor viewing area overlooking the Falcon. 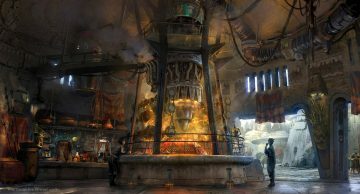 In the control tower, you will encounter an animatronic of an older version of Hondo Ohnaka (voiced again by Jim Cummings), who alongside his droid R5P8, will set-up the ride. The boarding passes will allow you to spend some time in the Falcon, exploring the quarters and taking photos before you make your way to the cockpit to go on your adventure. The ride will have a single rider line, which makes sense considering that most parties will probably not evenly fit into the six seats in the attraction. The Millennium Falcon apparently still has some porgs on board that have stowed away from Ahch-To. 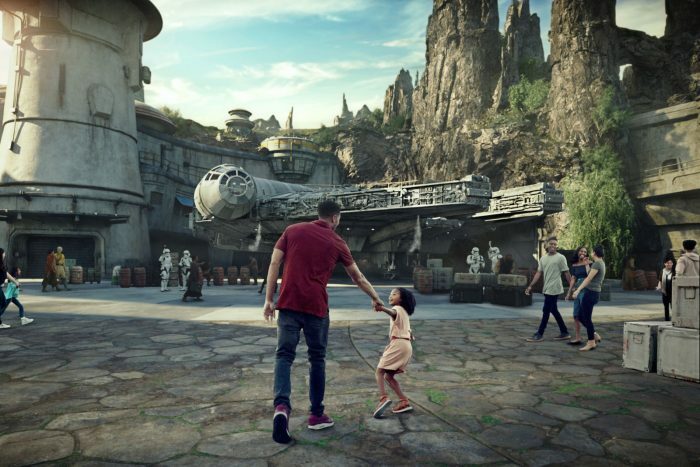 Disney is still unwilling to reveal an opening date for Galaxy’s Edge, but if you look at the block out day calendar for the Disneyland annual passes, it looks like late June 2019 is what was planned. It is possible for them to be behind on construction, so while I think June 21, 2019, is a good guess, I wouldn’t bet money on it. 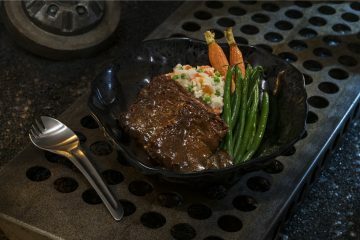 The post Star Wars Galaxy’s Edge Details Revealed: Lightsabers, Droids, Food, Rides and Much More appeared first on /Film.